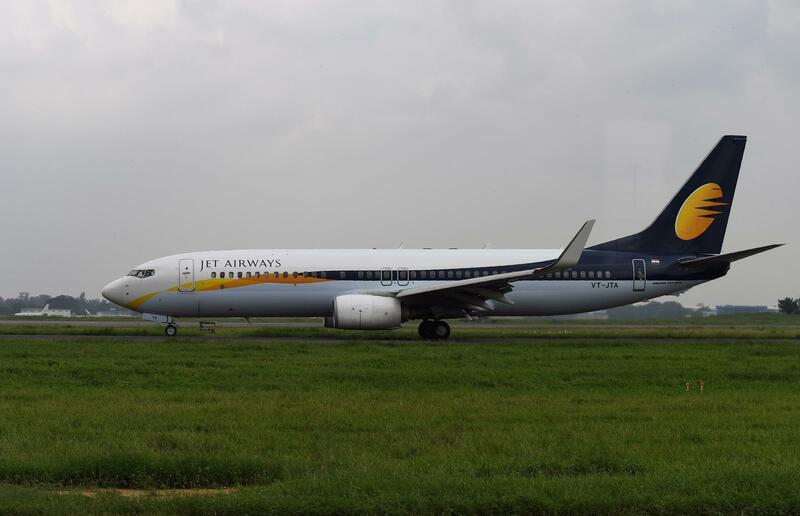 A Jet Airways plane at Indira Gandhi International Airport in New Delhi earlier this month. The flight turned back "due to loss in cabin pressure," according to a statement from the Indian international airline. But as the Hindustan Times reported, the country's civil aviation regulator stated that this happened because, "during the climb, crew forgot to select switch to maintain cabin pressure." Jet Airways says the cockpit crew "has been taken off scheduled duties pending investigation." The Times reported that India's Aircraft Accident Investigation Bureau has launched a probe into the incident, and the airline said it is "extending full cooperation." The flight had been bound for Jaipur, a popular tourist destination in northern India. "I was sitting on an aisle seat when suddenly air pressure in the cabin dropped and oxygen masks came down," passenger Prashant Sharma told India's PTI news agency. "I saw a passenger sitting next to me bleeding from the nose. Several others complained of extreme pain in their ears." Several of the passengers complained about a lack of information provided by the crew during the incident. One of them, Satish Nair, stated that the airline staff did not provide passengers with any explanation about what was happening: "no staff to help," he said in a tweet, "...no announcement on board to wear the oxygen mask." He complained that the safety of passengers was being ignored. According to PTI, another unnamed passenger said that the plane "circled overhead for around half-an-hour before landing. There was no announcement (related to the problem) from the crew." The airline said five people were hospitalized and have been released. It added that 144 of the original flight's passengers have been transported to Jaipur on a different flight, and 17 decided "to travel at another point in time." This comes at a somewhat tense moment for the airline – according to Reuters, it is "struggling to cut costs and embroiled in a pay dispute with pilots." Jet Airways "posted a loss of about $189 million for the April-June quarter," the wire service said. And in January, the BBC reported, the airline "grounded two pilots following reports of a fight inside the cockpit of a flight from London to Mumbai." That flight landed safety, the broadcaster added.